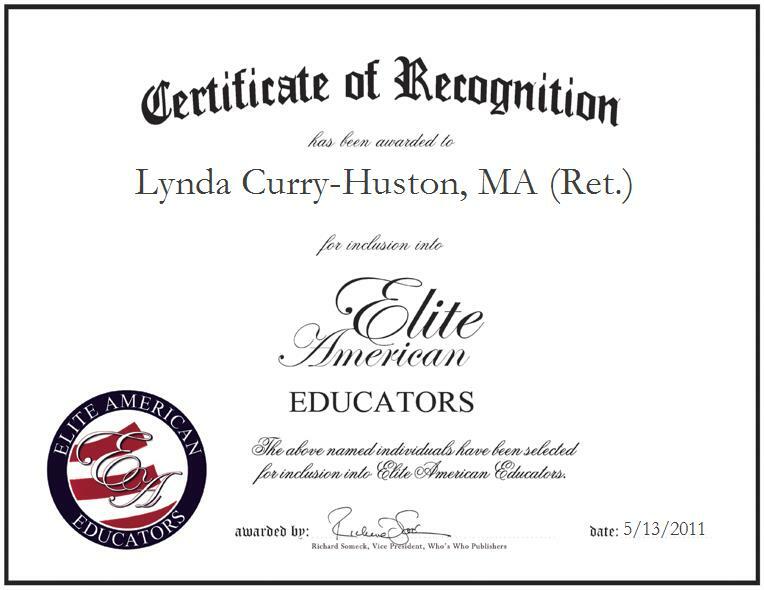 Akron, OH, May 13, 2011, Lynda Curry-Huston, Retired Kindergarten through 12th Grade Art Instructor for Cuyahoga Falls City School District, has been recognized by Elite American Educators for dedication, achievements and leadership. During her 24-year career in art education, Ms. Curry-Huston was always excited to share her passion for art with her students every day. She taught several differing art classes that focused on commercial art, including graphic design, painting, colored pencils and oil pastels. Her students enjoyed the support and encouragement they received from Ms. Curry-Huston; while her peers praised her ability to introduce, instruct and demonstrate the many facets and media of art education. In recognition of her dedication and outstanding teaching skills, Ms. Curry-Huston was recognized by the Cuyahoga Falls Education Association on three separate occasions. She was also invited as one of eleven educators to attend the first United States-China joint conferences on education in Beijing. Ms. Curry-Huston attended Fairmont State University in West Virginia for her undergraduate degree. In 1972, she organized an art show that was recognized as the best among the school’s other shows. That same year, she completed a Bachelor of Arts in art education and journalism. Having developed a great interest in theater production, she returned to The University of Akron to complete a Master of Arts in theater and design technology. Ms. Curry-Huston’s master’s thesis focused on the analysis of the set design for the play “The Fox.” She remained at the university to pursue a Master of Arts in nonprofit arts management, where her thesis topic covered her experience in a Cleveland gallery. Now retired, Ms. Curry-Huston enjoys visiting the many art museums and galleries of Northeast Ohio. A lover of nature, she volunteers her time with Summit County Metro Parks.